During the Second World War (WWII) some of the men and women of the Netherlands went into hiding and became members of the resistence groups, The Dutch Underground. Officially these people were NOT registered as military personel and in the case they were killed in action there would be no compensation. My daddy was known as Jopie until around 1940 when he became part of the resistence, the Underground, after that he was most likely known by a nickname which would have changed several times over the years so one person could never been associated with one name. The nicknames were for two reasons, one so that German spy's hearing the name still wouldn't know who that person really was, and secondly to protect both yourself and the man or woman you had to meet to handover a message or a packet. You never knew what was in that message or packet, all you could only guess at it's contents. The nicknames and never knowing what you carried was so that if you did get into trouble you would not be able to tell what you had delivered or who you had delivered it to, that way no one else could get in trouble - the message and contents were safe for a little longer. Each cluster consisted of a leader and 5 to 8 men or women who were mainly used as spies or couriers. The leaders of each group were in contact with a certain district. In 1944 the resistence was officially organized and on October 16th, 1944 my dad was enlisted to the Limburg Command, Section Heerlen, 2nd company where he served as a member until January 1st, 1945. I know that daddy's family also took part in the resistence, taking in the Allied soldiers until they could continue on safely. My dad and his group lived in caves, stables or sometimes just under the sky and their job was to do anything they could that would cause hardships to the Germans who were occupying Holland. These people risked their lives to rescue allied airmen and other captured prisoners from the German POW camps, disable and/or destroy the German trucks and even the tanks when possible. SOME OF THE RESISTANCE WERE ARRESTED AND EXECUTED BECAUSE OF A TRAITOR. In February 1942 the coalmines went on strike as a form of resistence, including Emma which is where my dad, his father and brothers all worked. The strike was roughly broken by the Germans and some of the miners were executed. This was a major problem for the resistance. When the members of the Underground attacked the Nazis, the Nazis often took their revenge by killing innocent people. As the allied forces invaded Belgium the Dutch prince, Bernhard, ordered the topman of all the clusters to make a special army group to assist these allied forces...this army made up of ex-resistence men and named by the Prince Himself, became known as the STOOTTROEPEN(Stormtroopers). The one requirement to join this special group was that you HAD to have been active in the Underground. My father was a part of this group, a Stoottroeper. These men, the Stoottroepen, were the first military unit to be established on liberated Dutch soil in Limburg and Brabant, then the Allies fought their way up North and into Germany. The Limburg Regiment joined with the American Army and the Brabant Regiment was attached to the 21st British Army. The Limburg regiment districts were in South Limbrug and numbered 1, 2 and 3 and the battalions were the same ... Battalion 1 was Maastrict; Bat. 2 Sittard and Bat. 3 was the mine's district which consisted of all the southeast corner of Limburg making them the biggest district of the south. My father's identification number was 3552 for Battalion 3. 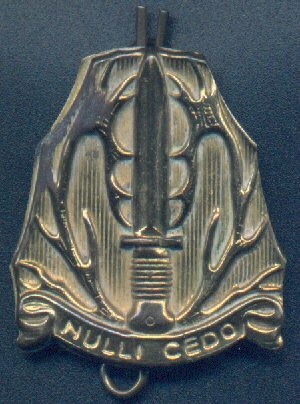 He and his battalion were placed in the 9th U.S. army. As the men were doing tasks for the army they still had no uniforms and only German weapons so they were ordered back to Limburg because it was too dangerous for them in civilian-like clothes, the Americans did not always know the difference between the plain clothes Stoottroepen and the Germans. Once they were registered the uniforms the men became "real" soldiers. The Stoottroepers received a U.S. uniform in late October and then went with the 9th army entirely through Germany going as far as the Elbe river, up north til Braunswijk more to the south. The Stoottroepers liberated BUCHENWALD and some smaller prison camps as well as doing duty as M.P. 's (Military Police), guarding food supplies (my daddy held this duty and was able to sneak food to a woman P.O.W. in a concentration camp and keep her alive until the camp was liberated), Petrol dumps and war prisoners, regulating the traffic near the frontlines, controlling the passes of German civilians and occasionally were in combat. Many times these men had to dig in at the frontlines and holdup for a few days living only on K. rations --- crackers in the morning, crackers at noon with a tin of meat and crackers in the evening with a tin of pork --- and of course a can of water, but they survived. It was at that time these men learned as never before what it meant to have a comrad you could depend upon. How much the 9th U.S. army valued and appreciated the Stoottroepen was proven when on February 20th, 1946 the U.S. Provost Marshal of the 9th army awarded the Bronze Star to the leader of all the Stoottroepen, Major B. van Kooten. In the Provost Marshall's letter he paid high tribute to all the Stoottroepers in his army. The decoration was meant for all the Stootroepers. The Brabant Regiment, attached to the 21st British Army, got 3 weeks of very basic training and on a rainy Sunday afternoon were driven to the River meuse (Maas), near Boxmeer and told to dig themselves in. They started to dig, not realizing they were doing this in full view of the opposing Germans on the other side of the river. That night, taking up positions, they "copped a hell of a lashing" from the German mortars. That was their first fire baptism. Luckily there were no casualties. They spent three uninterrupted months in the trenches in snow and mud before they discovered they were the only allied troops doing that. The British and the Americans did nine days in the trenches and had nine days off behind the lines. When the front started to move into Germany, early 1945, they moved along right up to Remagen on the river Rhine. They then pulled back some distance to occupy an area in West Phalia. When Germany capitulated those who had signed to go and fight the Japs in the Pacific were sent to Harskamp where they joined the Limburgers. As a second job for the Brabant men in Harskamp they had to look after a Dutch SS regiment, taken prisoner nearby in the last days of the war against Germany. 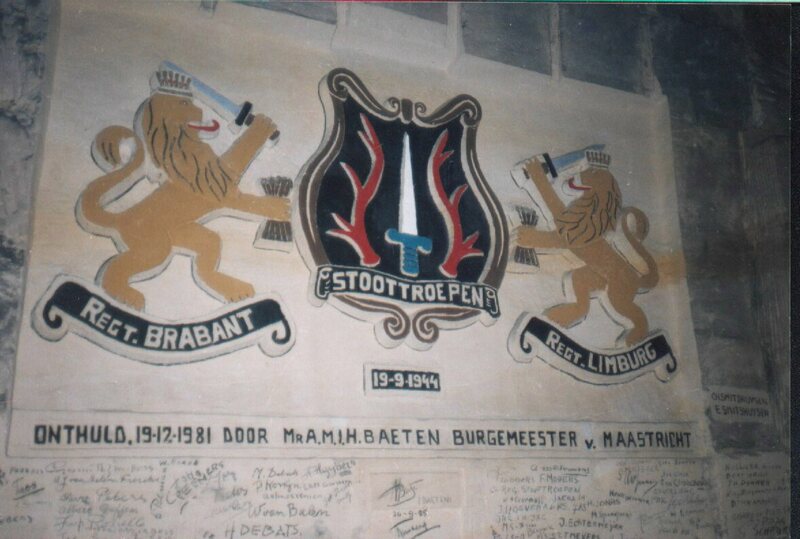 On To the Dutch East Indies After the capitulation of Germany the Stootroepers that wanted to go as volunteers and free the Dutch East-Indies (Indonesia) were rebuilt into Battlion 1 Regiment Stoottroepen . My dad was one of these men.